This topic contains 14 replies, has 3 voices, and was last updated by Alexander Bautz 5 days, 11 hours ago. What settings are available for a full width for forms with vlookup to doc lib. Please add a screenshot so I can see exactly what you mean. Which version of DFFS are you running? I tried to set up a similar config, but my vLookup table fills the entire form width – can you show me a screenshot of the tab configuration for this tab? Also a clean install not a upgrade. This reply was modified 7 months ago by Brian Cone. Attached in the tab view. 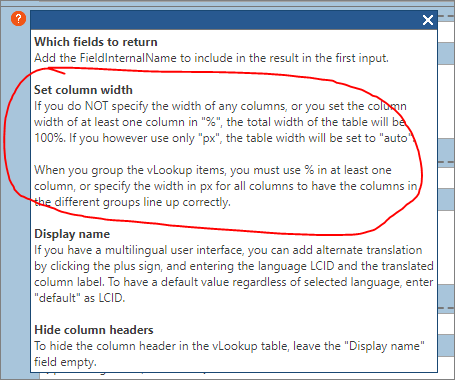 You must either change the width to use percentage, or remove the width set on each column – refer the help icon on the ViewFields section (attached). Thanks for looking at this, however this does not fix the table width. It does not go full width of the screen. I have change the width of the fields by px (for a auto total table width) or % or blank but the width of the table never changes it appears to be fixed. When changing the fields this setting changes the fields width not the total table width. Unfortunately I’m not able to recreate this issue. Could you use the developer tools (right click the vLookup table and select Inspect) to try to identify what is limiting the width? – you can click on each HTML element – like the table – and look at the style applied to each tag. Thanks for helping Alexander. I’ve looked at all the elements and noticed that they are either setup to auto width or width to 100%. Is there anything else I can look at to discover the conflict? thanks. It’s hard to tell. If I could log in and look at it I might be able to figure out what’s causing it. If so, email me the login details. It seems that the vlookup has a fixed field width, with or without grouping. Setting the fieldwidth in the tab CCS field does not work. Is there a way to increase the width of this field? The field widths in all displayed fields in the vLooup definition are defined in pixels but that information is not used. The image is a bit blurry – is it the totals row you want to stretch to the full width of the vLookup table?